When it comes to quiet, understated performance, Audi's big-engined Q5 50 TDI is the peak of the Ingolstadt bunch, and it’s based on the same underpinnings as the less popular A4 sedan. The five-door, five-seat, Q5 sits in the middle of Audi's growing range of SUVs. Is it the perfect fit for you? At $84,700, the Audi Q5 50 TDI Quattro sport sits at the top of the price pile. It comes standard with leather trim, heated and powered adjustable front seats, as well as smart key automatic tailgate with a foot opening function. An 8.3-inch multimedia system with satellite navigation and a handwriting pad for the multimedia system is included, and it's also equipped as standard with a 12.3-inch digital dash and wireless phone charger. The steering column is powered, while the exterior features 20-inch wheels, LED headlights and roof rails. A technical package costs $5,600 and includes a 19-speaker Bang and Olufsen stereo system and a heads-up display, as well as other elements. Air suspension is another $4,000, while massage seats cost another $1,300. In terms of competitors, the Q5 50 TDI goes up against cars like Mercedes Benz GLC 250D and the BMW X3 xDrive30d. It's interesting to note that all these cars are within $200 of each other at retail. The Q5 sits below the Q7/Q8 and above the Q3/Q4 in Audi's burgeoning SUV range. In terms of interior space, the rear ends of the car can hold 550 litres of luggage, though if the car is fitted with the optional sliding second row of seats, this increases to 610 litres. It’ll swallow 1550 litres with all the seats down. You can flip the rear seats down via handles in the cargo area, but the seats will then lock down in position, requiring you to go to the rear passenger doors to unlatch them. In terms of second-row room, there is plenty even for the tallest of passengers, although it is a more comfortable proposition for two passengers rather than three as the centre seat is awkwardly shaped and more designed for use with the wide armrest that pulls down. Interestingly, the seats configured in a 40/20/40 style so that the centre seat can be dropped to create an enlarged ski port, which is quite a practical proposition. Front room is excellent. The seats are deep, wide and long while the seat bases can also be extended for more under-thigh support. The optional massage pack is an expensive option that you may or may not use that often, but the heated seats are a definite perk. The steering wheel feels quite large, but it is well shaped, and there are shift paddles behind the wheel to operate the gearbox. Speaking of the gearbox, I'm not a massive fan of the trigger style auto shifter, which requires pretty deliberate operation in order to make sure that it's in gear, but at least it's easy to get to park simply by pressing the P button. I just prefer the security of the old fashioned style of gear lever that locates more precisely. There are two USBs and a 12-volt point in the front of the Q5, as well as the optional inductive charging pad that sits under the centre bin armrest, taking up a chunk of space in the interim. There are two cup holders up front, as well as large bottle holders in each of the doors. Rear seat passengers can adjust their own temperature and can also plug in their own devices. With the airbag suspension as well, loading can be made much easier by the use of a novel switch in the cargo area, which deflates the suspension airbags, dropping the car about 30mm. The suspension returns to normal when you start the engine. It's a novel feature which, when combined with the load loading lip and the nice square load area, really makes the Q5 a doddle to pack. Add to that features like cargo net with decently sized cargo hooks as well as a plastic bag hook to the rear cargo area to hang your takeaway meal, makes the Q5 a pretty practical proposition. The tailgate does offer a foot-operated function, which as usual was hard to access in real life. The Q5 comes standard with eight airbags, as well as rear-view camera and a360-degree view camera. It has all manner of driver safety aids including lane departure, adaptive cruise control with traffic jam functionality, as well as rear cross traffic alert and AEB for pedestrian and cyclists. There are also two ISOFIX baby seat points for younger passengers. The Q5 is strictly a five-seater proposition only. Over 550 kilometres, we recorded a dash-indicated combined fuel economy figure of 8.5 litres per 100km, against Audi’s claim of 6.7L/100km. Its 68-litre tank should waft you about 800km on a single fill, and it will cost you around $100 to top it up. Audi – along with the other premium brands – still only offers a three-year, unlimited-kilometre warranty, with service intervals suggested at 12 months or 15,000km. A three-year fixed-cost service plan for the Q5 costs $2040, while a five-year plan costs $3070. The Q5 50 TDI’s party trick is its Porsche-derived V6 turbo-diesel engine that’s mounted in a traditional north-south orientation. It’s backed by an eight-speed auto that sends drive to all four wheels. With healthy outputs of 210kW and – more crucially - 620Nm, the Q5 is a strong, calm and quiet highway demolisher. No diesel rattle makes its way into the cabin, while the optional air-sprung suspension does a great job of making bumps disappear. There is a trade-off, though; the air-sprung suspension isn’t as precise underhand as a more traditional steel-sprung set-up, though you can gain a bit of feeling back by dialling the Q5’s drive mode system to Dynamic. This also sharpens up the gearbox’s shifts, which helps to keep the engine on boost and avoids the slight turbo lag delay from rest. The stiffened air springs are definitely firmer, but not overly so. The advanced adaptive cruise control systems aboard the Q5 are great, as well, with a big tick for the traffic jam mode. The lane-keeping functionality is also very impressive and can be easily turned off via a button on the indicator stalk if you don’t like the quite pronounced level of steering assistance under your fingers. The interior of the Q5, too, is terrific. All surfaces within sight of driver and passenger are well rendered, and the dials and switchgear are a step above, as well. Having tested the new A7, we’re spoilt by Audi’s updated infotainment systems; not having a touchscreen in the Q5 actually feels quite old-school already. Navigating Apple CarPlay, for example, isn’t very straightforward using the central wheel. Otherwise, the big Audi is a quiet, comfortable companion in and out of the city. Cheap it is not, but the quality shines through everywhere you look. 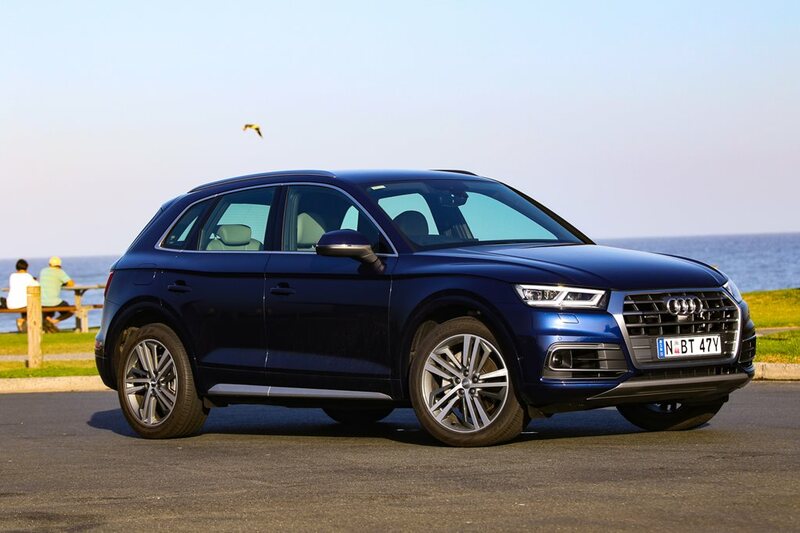 The V6-powered Q5 is the dux of the class, with impeccable, underplayed road manners and a genuine feeling of everyday luxury pervading its cabin. It looks a little plain, perhaps, but it’s very much a case of not judging a book by its cover. Be careful with the options list, though… you’ll fire the Q5 50 TDI over $100,000 before you know it.